South African President Jacob Zuma has announced an inquiry into violence at Lonmin Marikana platinum mine, calling the deaths there “tragic”. Thirty-four people were killed when police opened fire on striking platinum miners on Thursday. At least 78 people were injured in the confrontation. President Jacob Zuma said he was “saddened and dismayed” at the “shocking” events and offered sincere condolences to all families who had lost loved ones. The president said his thoughts were with the families of those who had lost their lives but also with the police “who have to intervene in difficult situations”. 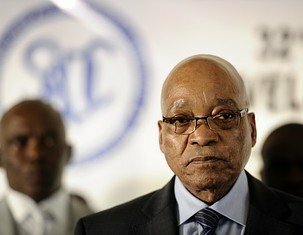 President Jacob Zuma has announced an inquiry into violence at Lonmin Marikana platinum mine, calling the deaths there "tragic"
The president said it was a “cornerstone of hard-won democracy” to allow for peaceful protests, but added that today was “a day for us to mourn together as a nation – a day to start rebuilding and healing”. Jacob Zuma had cut short his attendance at a regional summit in Mozambique to deal with the crisis. He will later visit some of injured being treated in hospital. Some of the strikers’ wives gathered near the mine on Friday, chanting anti-police songs and demanding to know what had happened to their husbands. “Police, stop shooting our husbands and sons,” read a banner carried by the women, according to the Associated Press news agency. A strike at the mine began a week ago and had claimed the lives of 10 people, including two police officers, before the incident on Thursday. Police were then sent to break up 3,000 miners – some armed with clubs and machetes – who had gathered on a hillside overlooking Marikana to call for a pay rise of about $1,000 a month. The circumstances that led police to open fire remain unclear, but reports from eyewitnesses suggest the shooting took place after a group of demonstrators rushed at a line of police officers. Police, armed with automatic rifles and pistols, fired dozens of shots, witnesses said. Police chief Riah Phiyega said officers “were forced to use maximum force to defend themselves”. She said 259 people had been arrested on various charges. The Association of Mineworkers and Construction Union (AMCU) accused the police of carrying out a massacre. “There was no need whatsoever for these people to be killed like that,” General Secretary Jeffrey Mphahlele told Reuters news agency. The miners, who are currently earning between 4,000 and 5,000 rand ($484-$605), say they want their salary increased to 12,500 rand ($1,512). South Africa is the largest platinum producer in the world and the dispute has already affected production. Lonmin, the world’s third-largest platinum producer, has encountered similar labor disputes at the Marikana mine. In May 2011, the company sacked some 9,000 employees after a strike.